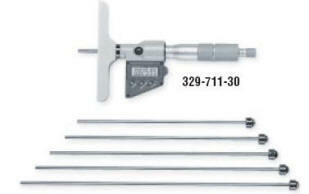 Zero-Set key allows for setting zero measurement at any point along spindle. Each unit comes complete with a battery (offers 6 months of life under normal use), key spanner, other adjusting wrenches, fitted carrying case, manual. Data Send button for transmitting readings to SPC systems. Runs off single SR44 battery. Automatic power-off after 20 min. idle time.